Marathon County farmers, Ryan and Lindsey Prahl, were selected as the winners of the Wisconsin Farm Bureau Federation’s Young Farmer and Agriculturist Achievement Award at the organization’s 99th Annual Meeting on December 2. Farm Bureau’s Achievement Award is a contest that awards farmers between the ages of 18 and 35, who have excelled in their farming career, understand current issues affecting agriculture and have shown leadership and involvement in Farm Bureau and other civic organizations. The Prahls are fifth generation dairy farmers in rural Wausau in Marathon County. Together the couple juggles the dairy and an emerging custom business. They have three children Lydia, Warren and Audrey. They are involved with the St. John’s Lutheran Church and school in Easton. In their free time, Ryan and Lindsey enjoy volunteering for agricultural organizations. They are members of the Badger 4-H Club and active members of the Genex and Foremost Cooperatives. Convention in New Orleans, Louisana. 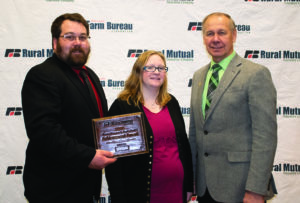 In addition, Rural Mutual Insurance Company provides a free financial plan, FABICK Equipment, Inc., provides 40 hours use of a FABICK skid-steer loader and the winner is invited to the GROWMARK, Inc., annual meeting in August. The other finalists were Josh and Ashley Claussen from Brown County; Dustin and Ashley Ellis from Buffalo County; and Brian Douglas from Dunn County.